According to SpamHaus, confirmed opt-in means that the recipients has confirmed permission for the address to be included on the specific mailing list, by confirming (responding to) the list subscription request verification. Confirmed opt-in ensures that the recipient subscribed using a valid email address and with the email address owner’s permission. It legally protects the email sender because the subscription confirmation received from the recipient proves that the recipient intentionally subscribed and grants permission for the mailings. With that in mind, we designed our WPNewsman plugin so that it allows to collect subscribers around a WordPress site using the confirmed opt-in or double opt-in method. However, some users believe that the single opt-in method is better because it does not require an extra step from the subscriber while you still have the proof of the subscription fact. Below we’d like to shatter the most widespread myths about the confirmed opt-in method and explain why we implemented confirmed opt-in in WPNewsman. Myth #1. I’ll get less subscribers because of confirmed opt-in. It’s true that some email addresses on your list will never be confirmed. The percentage of unconfirmed email addresses depends on various factors, including anti-spam filters at the recipient’s side, precision of the instructions on your “Confirmation Required” page and in the confirmation message and smooth work of the entire subscription and confirmation process. You must accept that from 10% to 20% subscriptions will be undeliverable a priori. They are not temporary undeliverable but permanent dead email addresses. The experience shows that only nearly 70% subscribers enter their valid address. So, a third of recipients deliberately subscribe with a bogus email address. 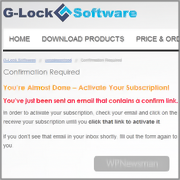 Do not forget about malicious subscriptions that are likely to happen. If you don’t confirm the subscription and start sending to the recipient who did not give his consent to receive your messages, you are classified as an unintended spammer. The bad thing that ISP do not see the difference between unintended spammers and real spammers and the “chance” for you to be blocked remains the same. As you see, this is the case when having fewer addresses on your list is better. By using the confirmed opt-in method you cut down dead and unwanted subscriptions right off the bat collecting only those people who actually want your emails. Myth #2. I’ll get less sales because of confirmed opt-in. Do you think that people who subscribed with a dead email address or whose email was added to your list without their consent are likely to buy from you? Instead of making assumptions or listening to someone else’s opinion make a test yourself. Switch to the double opt-in method and track your sales. We have discovered from our own experience that our sales did not decline after we started using confirmed opt-in. We are pretty sure that providing a good incentive and setting expectations for a website visitor to subscribe and confirm their subscription will help you ensure an optimal conversion rate through the whole opt-in process. Myth #3. I’ll lose subscribers because they may never receive the confirmation email. You will do the right thing if you setup test accounts with large free ISPs like AOL, Yahoo!, Hotmail, Gmail and test your subscription process yourself to see if your confirmation email is delivered quickly and to the Inbox. Some large ISPs like Yahoo! can occasionally take more time than usually to deliver messages into the Inbox. It seems that the message vanished into thin air, but then it appears a dozen of minutes later. on your confirmation page ask the subscriber to add the email address you will send your newsletters to their safe sender list of address book to ensure your future emails will be delivered to the Inbox. Myth #4. People joined my list offline. They won’t confirm something they have already confirmed. Do you think people may be irritated to have to confirm their subscription online again? Just wonder if they will actually have the time to read your newsletters and click your links in them if they don’t have time to click on the confirmation link. You always have the ability to customize the page that displays after the user hits the Subscribe button. You can explain the users that following the best email marketing practices they must confirm their subscription by clicking a link in the confirmation message. The confirmation is needed to create a proper record in your database that serves the proof that you are not sending unsolicited emails. You can even tell this to them when you’re talking to them in person. Myth #5. People receive too many emails they have to deal with. I don’t want to overload them. Just believe that your confirmation email is like a drop in the ocean. It makes no big difference. To urge the subscriber confirm their subscription and maximize your confirm rate, think about incentives — give people something immediately after confirmation: free download, PDF report, e-book, discount coupon or whatever you have that you think they would respond to. The confirmation process is supposed to protect, not hurt you. If you are using the confirmed opt-in method, you have a verifiable proof that your recipient requested to receive your emails, thus protecting yourself against spam complaints. Confirmed opt-in increases your chances for successful mailing. In these times of strict email sending policies and anti-spam measures, deliverability can be a problem. Why increase the risk for your emails of not being delivered? Using confirmed opt-in you make sure that your lists are 100% clean and verified and that 100% of your recipients have specifically requested your emails themselves. Spend your time for building your business with confirmed subscribers who want to receive your newsletters instead of getting yourself in troubles created by people who don’t want to hear from you. I got about 50% of people who don’t confirm their email. Do you have any idea how to improve this? Thanks very much! If you are sure that those unconfirmed emails are not spam bots, you can go to WPNewsman Settings in your WordPress dashboard and check the “Disable advanced honeypot technique” option. Click on “Update Options”. But in this case you may end up with many subscriptions made by spam bots. You can also go to “Unconfirmed” subscribers and click on the “Resend Confirmation Request” button. probably some of them will confirm their subscription. I understand the reasoning here, but is there any way to disable confirmed opt-in?